For more technical information about MoveRoll Zero Energy Receiver download our datasheet by clicking the button below. MoveRoll Zero Energy Receiver is the smart solution to cushion roll impact. Meant for low-frequency roll handling applications, the patented Zero Energy Receiver features special roll handing cushions. Notably, the Zero Energy Receiver does not need any energy sources to absorb the kinetic energy of paper or board rolls. Thus, many problems that are common with traditional roll receivers are easily solved. Especially, when rolls e.g. come down sloped floors they move in an uncontrolled manner and gain speed. Traditionally, steel stops or hard materials are used to receive the rolls, which causes them to bounce back and forth forcefully. 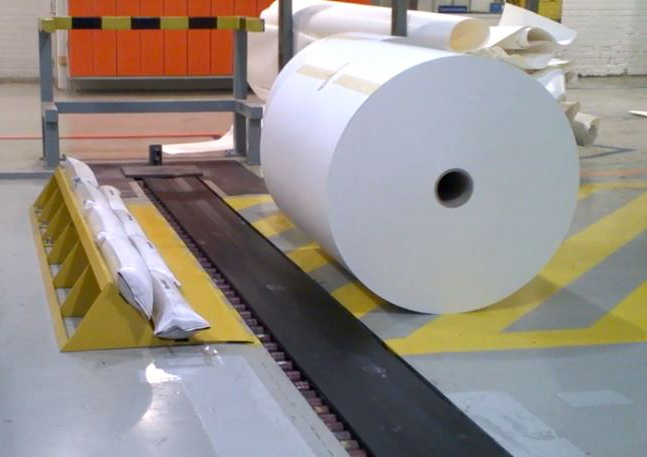 This results in a dangerous work environment, easily damaged rolls and longer roll settling times than necessary. MoveRoll Zero Energy Receiver improves these issues significantly. The self-inflating roll handling cushions are adjustable to ensure that rolls in different sizes and weights can be handled. Since the cushions absorb kinetic energy of the rolls, the bouncing back is greatly reduced. The material of the cushions is flexible and prevents rolls from hitting against the metal frame of the Zero Energy Receiver; hence, roll damages are avoided. Furthermore, the absorption of kinetic roll energy reduces the roll settling time significantly. This again leads to increased production efficiency. The main benefits of MoveRoll Zero Energy Receiver are clearly improved work safety; gentle roll receiving; and notable energy savings compared to traditional roll receivers.